Don Bosco Institute of Technology (DBIT), Mumbai, will be extending support and collaboration with FOSSEE, IIT Bombay. This association and involvement will help the faculty members and students to upgrade their knowledge and develop expertise in Free/Open Source Software (FOSS). The main aim of this partnership is to create awareness about GNU/Linux and help other engineering and science colleges to migrate from proprietary platform to Linux platform for their academic and research activities​ ​ and​ ​ also​ ​ provide​ ​ necessary​ ​ training​ ​ and​ ​ support. To​ ​ plan​ ​ and​ ​ execute​ ​ seamless​ ​ Linux​ ​ migration​ ​ process​ ​ in​ ​ laboratories. To provide online technical support for Linux installation and configuration along with installation​ ​ manual. To​ ​ conduct​ ​ Linux​ ​ training/workshops. Train​ ​ the​ ​ faculty​ ​ and​ ​ students​ ​ to​ ​ use​ ​ Open​ ​ Source​ ​ software. Develop​ ​ and​ ​ promote​ ​ Scilab,​ ​ OpenModelica,​ ​ eSim,​ ​ DWSIM,​ ​ OpenCV. Port​ ​ solved​ ​ examples​ ​ from​ ​ standard​ ​ textbooks​ ​ using​ ​ Scilab​ ​ and​ ​ OpenModelica. 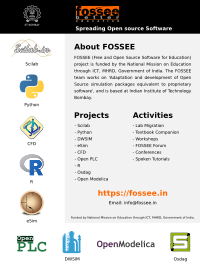 The Shanmugha Arts, Science, Technology & Research Academy (SASTRA) has joined hands with FOSSEE to create awareness and spread the use of free and open source​ ​ tools​ ​ in​ ​ education​ ​ and​ ​ research. Promote and introduce the general purpose free and open source modelling environment “OpenModelica” and other open source tools across different departments​ ​ at​ ​ SASTRA​ ​ University. Introduce FOSSEE tools – “DWSIM” and “OpenModelica” in undergraduate and graduate​ ​ chemical​ ​ engineering​ ​ curriculum. Provide exposure and thereby enable graduate chemical engineer to use free & open​ ​ source​ ​ simulation​ ​ tools​ ​ in​ ​ process​ ​ development. Another institute who have partnered with us is Thiagarajar College of Engineering, Madurai. They are organizing workshops and disseminating information about FOSS to rural government school students. They also are taking efforts to upgrade the training for​ ​ rural​ ​ government​ ​ offices​ ​ in​ ​ villages​ ​ around​ ​ Madurai. To​ ​ introduce​ ​ and​ ​ promote​ ​ GNU/Linux​ ​ installation​ ​ and​ ​ configuration​ ​ on​ ​ servers​ ​ and desktops​ ​ computers​ ​ across​ ​ various​ ​ laboratories​ ​ in​ ​ nearby​ ​ colleges. To​ ​ provide​ ​ seamless​ ​ GNU/Linux​ ​ migration​ ​ plan​ ​ from​ ​ proprietary​ ​ software. To​ ​ develop​ ​ projects​ ​ in​ ​ Python/Django​ ​ framework. To​ ​ explore​ ​ students​ ​ internship​ ​ opportunity​ ​ at​ ​ IITB. IIT Kharagpur is the first institution to partner with FOSSEE To address the paucity of understandable documentation, IIT Kharagpur has developed documentation for several important open source software engineering tools including Selenium, PlantUML, Milu, Jumble, Jmeter, Eclemma, Cobertura, WATIR, Redmine, and GanttProject. They also conduct​ ​ workshops​ ​ to​ ​ popularise​ ​ FOSS.